Two-time Dove Award winners By The Tree have made a name for themselves mixing the splendor of pop-rock melodies with the redeeming character of honest worship. Beyond the entertaining value of the band's hook-laden tunes lies a truly refreshing breath of air for the soul. Now with the release of their fourth studio album Hold You High, By The Tree finds themselves returning to the origin and purest form of their band: worship. Formed by frontman and Texas-native Chuck Dennie in 1997, By The Tree got their start playing praise and worship at numerous churches, retreats, and camps across the south and southwestern United States. Long before the recent glut of worship records became the norm in Christian music, By The Tree was ministering through their unique vein of praise and performance one youth group at a time. "By The Tree was about praising God right from the start," says Dennie. "Honestly, I never really thought about it as something that would necessarily lead to a big music career. I felt led by God to start this band and everything else just sort of happened." "Just happened" indeed. By The Tree rapidly built a spontaneous fan base wherever they played. The band decided to release a couple of independent records in 1999, ultimately selling over 30,000 combined copies by early 2001. Such a dramatic commercial response predictably sparked interest from various Nashville music folks, including then newcomer label Fervent Records (Provident Music Group/BMG). The band felt at home with Fervent, finding in them a partner to take their ministry to another level. Fervent released By The Tree's Invade My Soul as the band's and label's national debuts in 2001. Acceptance of the album in the Christian market was almost instantaneous, as copies of the debut charted in the Billboard Top 40 for both Christian and Independent albums. 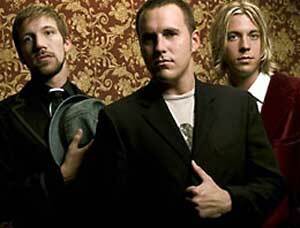 In April 2002 Invade My Soul stood out at the annual Dove Awards, winning for both Modern Rock/Alternative Album and Recorded Song. From that point on By The Tree found themselves increasingly involved in the business of making a career in music. The band toured extensively, playing with noteworthy CCM contemporaries The Newsboys, Delirious, and Jeremy Camp. By The Tree also enjoyed continued commercial success, releasing their sophomore venture These Days in 2002, followed by critically acclaimed Root in 2003, selling a combined total of 150,000 records to date. However, as happens to so many of us, the busyness of life took its toll. "By the time Root was released last year, I was really dragging," admits Dennie. "It was one of those things that I think we all go through as believers, where we get a little out of touch with God and lose track of what we're doing and why." It was while leading worship at a camp in Colorado in late 2003 that Chuck felt that tug of conviction and renewal. "I had this amazing experience where God just really refreshed my vision and reminded me of what he had called me to in the first place. I felt called back to worship in my own life, which in turn drew me to bring that experience into the studio with By The Tree." Revived, Chuck and the band headed into the studio in early 2004. After Tony Palacios (Audio Adrenaline, TobyMac) signed on as producer, recording sessions began in February and Hold You High started to take shape. By The Tree's drummer Aaron Blanton, no stranger to worship projects as a member of Sonicflood, agrees with Chuck that a special atmosphere surrounded the recording process. "It was really amazing, honestly, because it felt like God was in the middle of it all." The evidence of that blessing can certainly be heard in the final product. "I am very proud of this record," states Ben Davis, bass player and third member of band. "We have always worked very hard to create well-made music, and Hold You High is no exception. But this record is even more special because it reclaims and reinvigorates the foundation of this band." Chuck probably sums it up the best. "By The Tree has always been about joining and leading listeners in worshipping God. Hold You High is the first record since before we were signed to fully return to that foundation." As anyone who listens to Hold You High will certainly attest, this was a return worth making.